卢定彪, 肖加飞, 林树基, 杨海英, 吴开彬. 黔湘桂交界地区南华系划分——基于连续完整的贵州从江县黎家坡南华系剖面[J]. 地质通报, 2019, 38(2-3): 200-207. Lu D B, Xiao J F, Lin S J, Yang H Y, Wu K B. Subdivision of the Nanhuan System in Guizhou-Hu'nan-Guangxi border area based on the well-reserved Nanhuan System section in Lijiapo, Congjiang County, Guizhou Province[J]. Geological Bulletin of China, 2019, 38(2-3): 200-207. Abstract: Previous researchers failed to specify the stratotype section of 'Nanhuan System', and its internal division still has many divergences. China Geological Survey began to look for Nanhuan stratotype boundary system through 1:50000 regional geological survey. Through this work, the authors found a section in Lijiapo area, Congjiang County, Guizhou Province, which is characterized by well-reserved sequence, sedimentary succession, huge sedimentary thickness, clear layer and clear top to bottom line. Based on investigation of the section, field work in this aspect conducted in Guizhou-Hu'nan-Guangxi border area, northwestern Hu'nan and eastern Sanxia and other research results obtained recent years, and guided by complete development process of Nanhuan Great Ice Age, the authors have divided tentatively the interior of the Nanhuan System. According to sedimentary record of Lijiapo Nanhuan section, the Nanhuan great ice age is divided upward into Chang'an ice age, Fulu interglacial age and Nantuo ice age. The Nanhuan System can be further divided into three series:lower series corresponding to Chang'an ice age sedimentary sequence, middle series corresponding to Fulu ice age sedimentary sequence, and upper series corresponding to the Nantuo ice age sedimentary sequence. The results obtained by the authors have provided a more logical plan for dividing the internal Nanhuan System. Cowie J W, Bassett M G.丁荣炳译.国际地质科学联合会1989年全球地层表(用地质年代学方法和磁性地层方法标定)[J].地质调查与研究, 1990, (2): 45-54. 孙大中. 前寒武时代的新划分和命名[J]. 矿物岩石地球化学通报, 1989, 8(4): 243-245. 孙卫国. 前寒武时代划分方案浅析[J]. 地层学杂志, 1990, 14(3): 238-240. 全国地层委员会办公室. 第三届全国地层委员会第1次常委扩大会议[J]. 地层学杂志, 2000, 24(4): 99. 全国地层委员会. 中国地层指南及中国地层指南说明书(修订版)[M]. 北京: 地质出版社, 2001. 刘鸿允, 董榕生, 李建林, 等. 论震旦系划分与对比问题[J]. 地质科学, 1980, 4: 307-321. 刘鸿允. 中国震旦系[M]. 北京: 科学出版社, 1991. 全国地层委员会. 全国地层委员会"南华系候选层型剖面野外现场研讨会"会议纪要[J]. 地层学杂志, 2003, 27(2): 159-160. 卢定彪, 肖加飞, 林树基, 等. 湘黔桂交界区贵州省从江县黎家坡南华系剖面新观察——一条良好的南华大冰期沉积记录剖面[J]. 地质通报, 2010, 29(8): 1144-1151. 汪民. 构建新机制实现新突破努力实现国家地质工作新跨越:在全国地质调查工作会议上的讲话[J]. 国土资源通讯, 2010, 10: 24-31. Nesbitt H W, Young G M. Early proteozoic climates and plate motions inferred from major element chemistry of lutites[J]. Nature, 1982, 21(299): 715-717. Nesbitt H W, Young G M. Formation and diagenesis of weathering profiles[J]. Journal of Geology, 1989, 2(97): 129-147. 贵州省地质矿产局. 贵州省区域地质志[M]. 北京: 地质出版社, 1987. 广西壮族自治区地质矿产局. 广西壮族自治区区域地质志[M]. 北京: 地质出版社, 1984. 湖南省地质矿产局. 湖南省区域地质志[M]. 北京: 地质出版社, 1986. 贵州省地质矿产局. 贵州省岩石地层[M]. 武汉: 中国地质大学出版社, 1996. 广西壮族自治区地质矿产局. 广西壮族自治区岩石地层[M]. 武汉: 中国地质大学出版社, 1997. 湖南省地质矿产局. 湖南省岩石地层[M]. 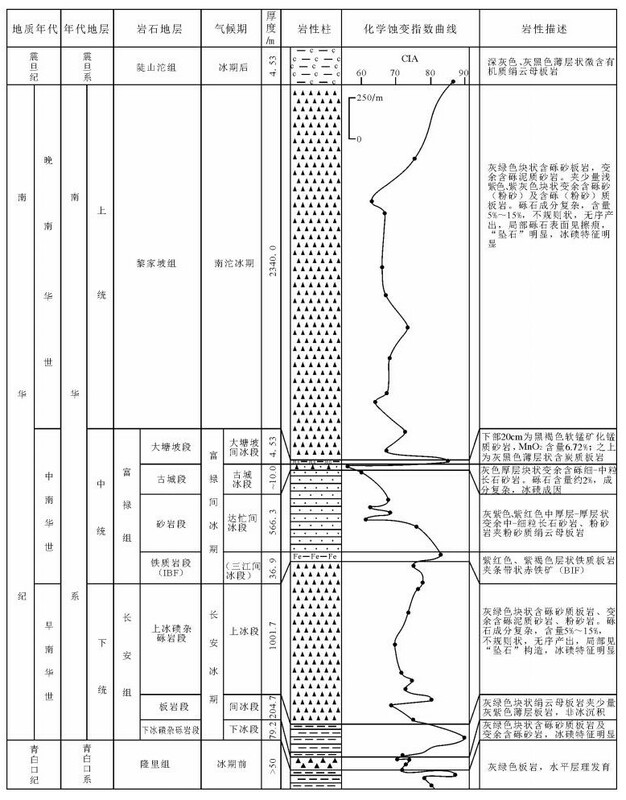 武汉: 中国地质大学出版社, 1997.
International Commission on Stratigraphy.International Chronostratigraphic Chart[EB/OL][2015-01]. http://www.stratigraphy.org/ICSchart/ChronostratChart2015-01Norwegian.pdf/. Zhang Q R, Li X H, Feng L J, et al. A new age constraint on the onset of the Neoproterozoic glaciations in the Yangtze Platform, South China[J]. Journal of Geology, 2008, 4(116): 423-430. 马国干, 王砚耕.鄂湘川黔毗邻地区早震旦世冰川地质问题的讨论[C]//中国地质科学院宜昌地质矿产研究所所刊第七号.北京: 地质出版社, 1983, 43-52. 冯连君, 储雪蕾, 张同钢, 等. 莲沱砂岩——南华大冰期前气候转冷的沉积记录[J]. 岩石学报, 2006, 22(9): 2387-2393. Kirschwink J L.Late Proterozoic low-latitude global glaciation: The snow ball earth[C]//Schopf J W, Klein C.The Proterozoic biospheres.Cambridge: Cambridge University Press, 1992: 51-52. Zhou C M, Tucker R, Xiao S H. New constraints on the ages of Neoproterozoic glaciations in south China[J]. Geology, 2004, 5(32): 437-440. 尹崇玉, 王砚耕, 唐峰, 等. 贵州松桃南华系大塘坡组凝灰岩锆石SHRIMP Ⅱ U-Pb年龄[J]. 地质学报, 2006, 80(2): 273-278. 全国地层委员会《中国地层表》编委会. 中国地层表(2014)[J]. 地球学报, 2014, 35(3): 插图Ⅰ. 肖宗正. 中国各地质时代地层划分与对比[M]. 北京: 地质出版社, 2005. 林树基, 肖加飞, 卢定彪. 湘黔桂交界区富禄组与富禄间冰期的再划分[J]. 地质通报, 2010, 29(2/3): 195-204. 王曰伦, 陆宗斌, 邢裕盛.中国上前寒武系划分和对比[C].王曰伦等.中国震旦亚界.天津: 天津科学技术出版社, 1980: 1-30.